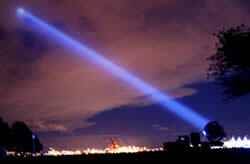 More than just a powerful shining light at your special event, searchlights attract real attention! People always wonder what the event is when they see the bright light in the sky and will often follow the searchlight's beam to the event. When people see these searchlights sweeping the sky they know something big is happening. Our carbon arc searchlights are available for promotional events in Vancouver, the Lower Mainland and surrounding areas (including Vancouver Island). Contact us for rates and booking information. - Transported to and from your site in the BC Lower Mainland at no extra charge. - Completely self-contained with their own power generator on truck or trailer. 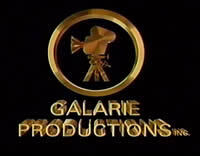 - Experienced operators are included with the promotional service. - Visible for 20 miles or more (depending on atmospheric conditions). - Proven effective in advertising for over 60 years. - Carbon arc - capable of generating a 60 inch wide beam of 800 Million Foot Candles.